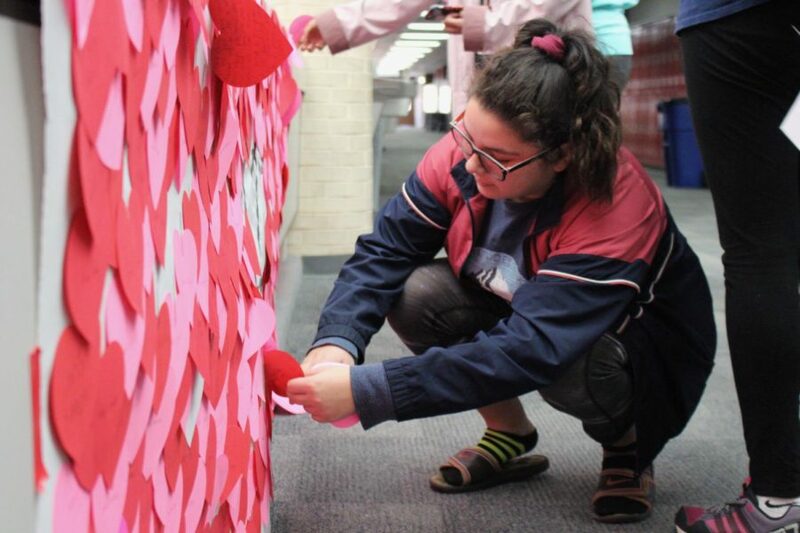 Coppell High School senior Delany Bell goes through the hearts on the senior bridge on Feb. 14. Student Council worked on a project to distribute paper heart cards to the entire student body. Every student in the school has their own paper hearts with personalized for the recipient, containing a touching message. However, since not all have a special someone to enjoy the day with, the Coppell High School Student Council wished to make the day exciting for every student with a special project. Since early January, the Student Council has been planning and working on a project to distribute paper heart cards to the entire student body. Their efforts came to fruition today, the cards lining the walls of A and B hall, as well as the senior bridge. All the 2,646 students in the school received their own paper heart. Each of the cards are personalized for the recipient, containing a touching message about the person’s personality, talents or other notable qualities. 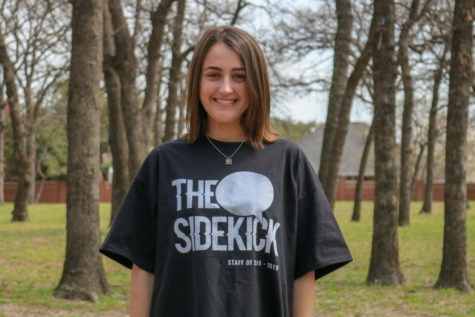 “I feel like [it is] nice for those who normally don’t feel as appreciated to get a little something to just know they’re loved no matter what,” CHS Student Council senior officer Jimena Benavides said. This the first year CHS has done the hearts project. Student Council sponsor Jonathan Denton heard about the idea and wanted Coppell to try it. Usually, the Student Council would only sell carnations or roses, but this year, the organization wished to exchange their previous traditions with something more all-inclusive. The project also proved to be a memorable experience for those involved. Student Council members came in before and after school and during off periods to create the colorful hearts, in addition to class time. After approximately a week of planning, the Student Council jumped into the project, creating an outline of how they would go about the task and designating roles for the officers. Soon after, they began cutting the hearts and writing messages in them. Student Council members were also asked to help out to write at least 15 notes per session, incentivized using the program’s point system. Many of the note writers found themselves reflecting on their memories with their peers as they scrawled on the colorful hearts. “It’s really nice to write something nice and think about your relationship with someone like, ‘Hey you’re really great! 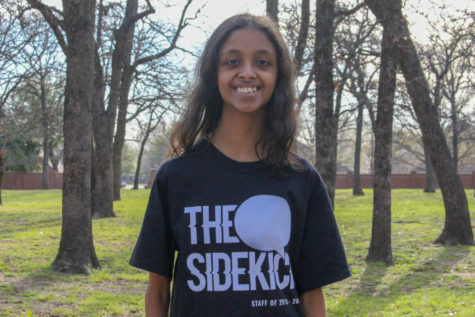 I like you because you make me laugh,” CHS Student Council junior member Tina Banthia said. However, Student Council ran into a few challenges, a large one being the sheer number of people in the student body. Such a large number made it possible to mistakenly leave someone out. Creating cards for more than 3,000 people required proper planning and organization. “Some of the challenges we had, I think, [included] just keeping up with the time and making sure we were on an effective schedule to make sure all the hearts got done [and] got put up the way we want[ed] them to,” CHS Student Council senior officer Anusha Mittal said. These challenges allowed members to identify issues and hopefully keep them from occurring in future. “We’re done now, but it would have been helpful to have more time to thoroughly plan it through. It was the first year, [so] I feel like it was good to learn and for next year, they can grow on it,” Benavides said. Student Council hopes to have put a smile on students’ faces today. “Hopefully it makes someone’s Valentine’s Day better and positively make an effect on those who don’t normally get something,” Benavides said. Follow Shravya @shravyamahesh on Twitter.